Home ⎢Sorb Storage: New research released! A new piece of research about the storage of partly used sorb has been published in the latest edition of Diving and Hyperbaric Medicine (Volume 48 No. 2 June 2018). The peer-reviewed paper will provide rebreather divers with some much needed clarity, and it is hoped that it will also help keep divers safe. Sorb is a soda lime material used to scrub or remove carbon dioxide (CO2) from expired gas in rebreathers. It comes in two forms - granular or solid rolls - and is packed into a canister that is then fitted to the rebreather. It is quite normal for rebreather divers to build their unit, including filling their canister with fresh sorb, one day and dive it the next. 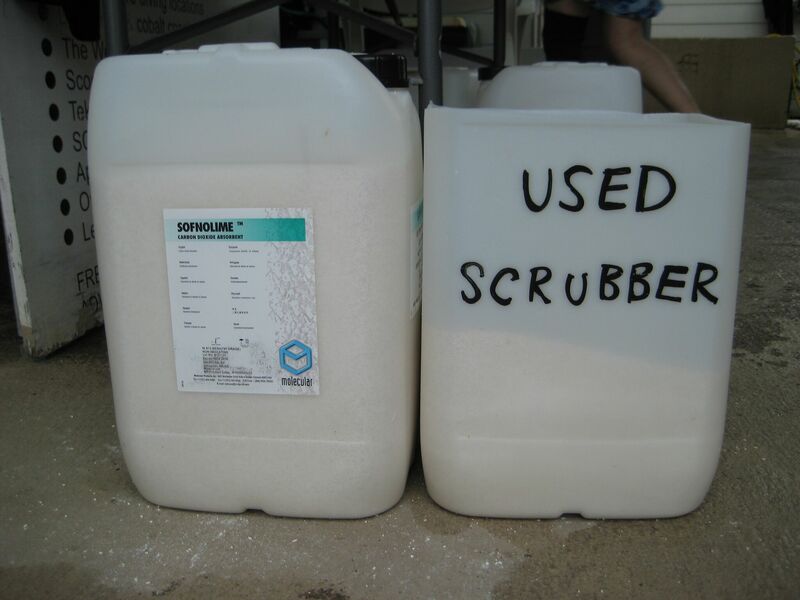 Liveaboard and scientific rebreather divers may also typically pack and dive their scrubber with fresh sorb on one day, and dive the same sorb again the following day. And it is known that some rebreather divers will dive pre-used sorb a number of days / weeks later. Therefore the rebreather community often debates whether it is acceptable to store and subsequently dive partly used sorb, and if it is acceptable, what protocols should be used for safety? The following are all quotes made on rebreather forums. "I had a great few days of diving planned in the 70 mt / 230 ft range, doing one dive a day. On the first two days I used fresh scrubber. On day three I decided to reuse my scrubber from day two - I had only done 90 minutes on it." "Never had any problem leaving my scrubber overnight. However, I can tell you from first hand experience that there is a difference between leaving a partly used scrubber unsealed overnight, and leaving it unsealed for a few weeks." "If being used the next day, then it overnights on the can. Otherwise I seal it in a plastic bag without any drying, as long as 4 weeks (have 3 scrubbers)." "It is now 8 or so months from initial fill of the scrubber. A total of 4 dives"
"I store the sorb in the scrubber, I have no problems with doing this for a few months AND I've been doing it for years"
This debate has been noticed by two award winning diving researchers. Last year Dr Neal Pollock (Université Laval, Canada) and Dr Simon Mitchell (University of Auckland, New Zealand), teamed up with Nicholas Gant, David Harvey, Peter Mesley and Jason Hart to research the best practice for storage of a partly used scrubber canister. The team partly used fresh granular sorb to simulate a dive, then investigated three storage scenarios: overnight unsealed, 28 days unsealed and 28 day sealed. The storage conditions were kept constant, in temperature and humidity, and after the storage period, the scrubber was re-installed in the rebreather and operated under the same conditions, using a bench test simulator circuit until the scrubber failed. The researchers believe the results have shown that sealing sorb is a good approach for prolonged storage. Rebreather divers should therefore consider placing partially used soda lime scrubber canisters in vacuum-sealed plastic bags if storing them for longer periods than overnight. If a partially used scrubber canister is to be used again the next day then the storage modality is unlikely to influence scrubber efficacy. It should be noted that a threshold 'prolonged' period was not established and is not defined. This work was financially supported by Shearwater Research, Canada via a research grant. In addition Ambient Pressure Diving, England provided an Evolution Plus rebreather and multiple scrubber canisters for testing purposes. EUROTEK - the European advanced and technical diving conference - has held a raffle at each event to raise funds for various diving charities, including Deptherapy and the Rubicon Foundation. In 2016 the monies raised were invested in a research fund to help advance technical diving safety. Ordinarily this important sorb storage study would have been embargoed for a year. Monies from the EUROTEK research fund have therefore been used to pay the early release fee so that divers throughout the world can benefit from this important research now. X-Ray Mag is therefore tracking the downloads of this paper on behalf of the researchers. We request that you do not upload this paper elsewhere, but point people at this article. Professor Simon Mitchell will be speaking at EUROTEK.2018 in Birmingham, England at the beginning of December. Tickets are on sale now if you wish to be in the audience.